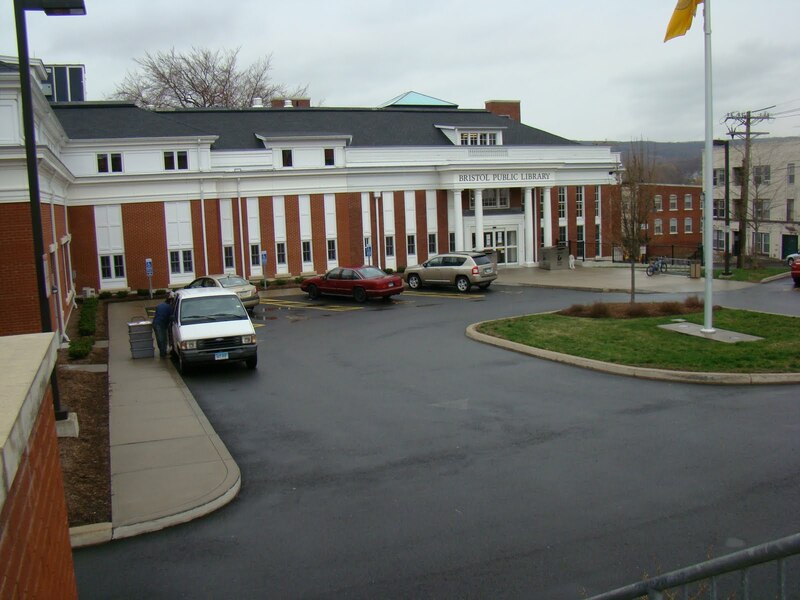 April 19, 2011: Bristol, Connecticut – Barclays and Ford! 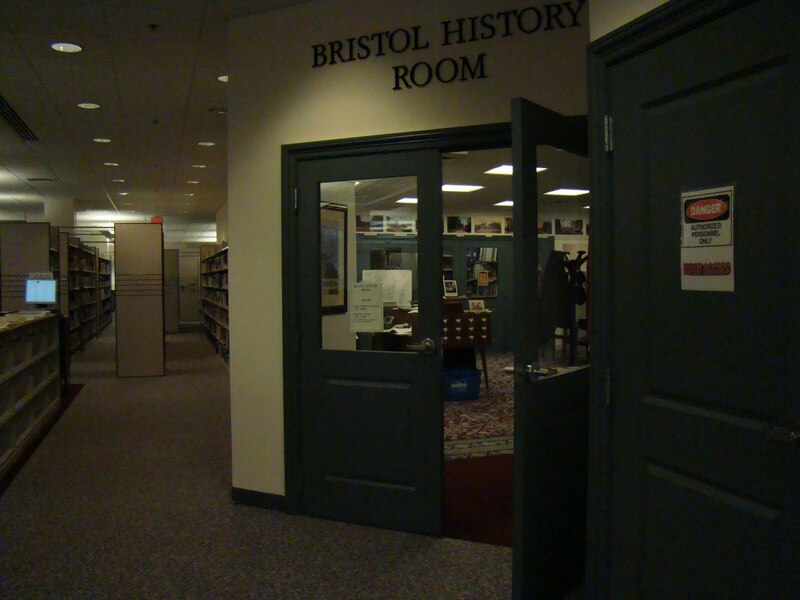 It was getting to late and I was going to miss the Bristol Public Library hours in the History Room if I didn’t get going. So I flew through Thomaston and crossed the bridge onto Hwy 6 going east. Originally I was going to stop at the Plymouth Town Hall and get the birth records for Ebenezer’s children but I was running out of time and somehow I missed it. Well the Plymouth Town Hall is in Terryville on Hwy 6 just beyond the turn onto Hwy 72. No wonder I missed it. No matter how much planning you do there are always problems. As I was driving along I realized I was no longer going to be in the “country” and that I was headed to the more urban areas around Hartford. The research shifts to back to my Barclay family. One of the Barclay siblings Mary married a Jerome Ford and settled in Bristol. 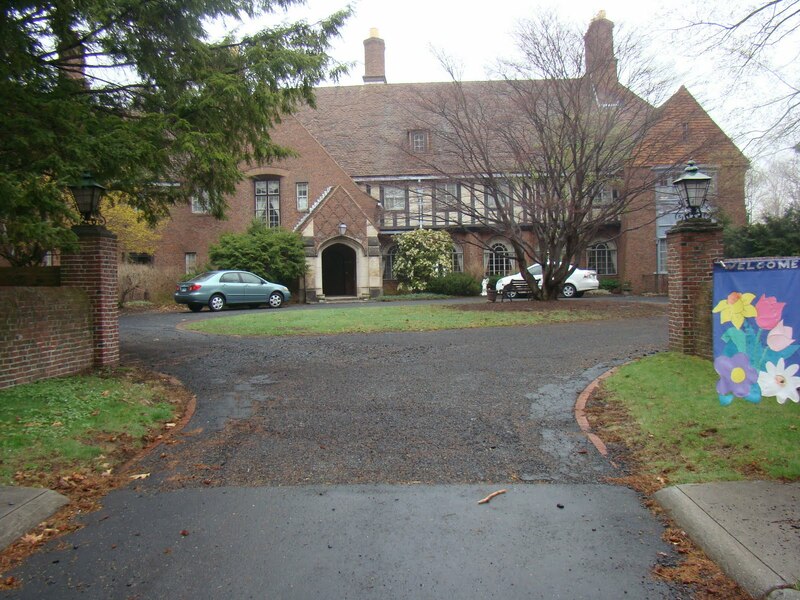 Last time I was in Connecticut I obtained her estate file at the Connecticut State Library. What I wanted to find out this time was where she and Jerome were buried and if I couldn’t learn more about the mother Margaret wife of John Barclay my great grandparents. 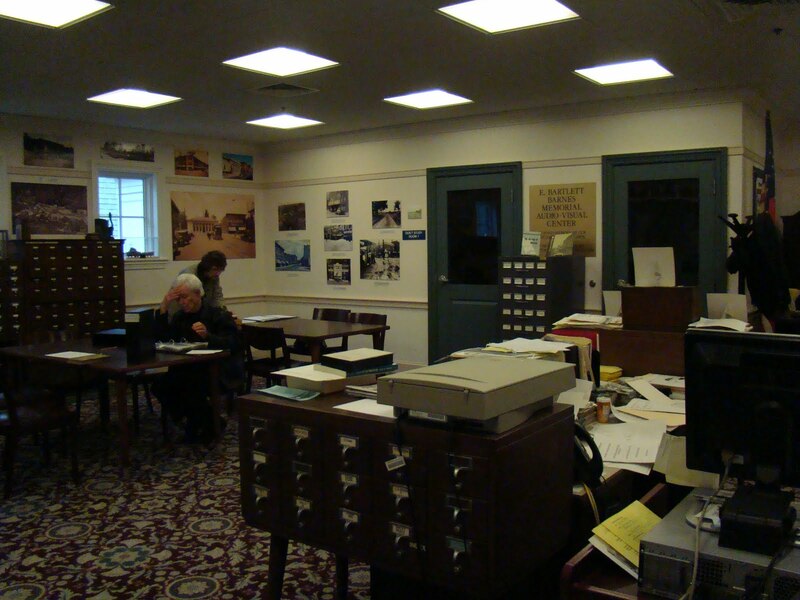 I had learned that the Bristol Public Library had a History Room and the hours were 2-4 pm and it was getting late. The library is on High Street off Main St. In Bristol there is N. Main and a Main St. The Main Street sign is bent? Yeah I know…tricky. I arrived in the library parking lot about 3 pm so I didn’t have much time. I lost a bit of time trying to figure out where I was in Bristol and my map was temporarily missing. Ah HA! I finally found it and then I figured out I was over on Divinity and once I realized where I was okay!!! Bristol Public Library, Connecticut – very nice! I found the History Room in the back of the library and entered. Here is the link. I recommend this source for Bristol. Excellent archive. The librarian was very helpful. I was required to fill out a form, present my driver’s license and then he could retrieve items from the locked vault area. There were several people there doing research and it opened up a lively exchange and got me answers. I had 45 minutes to figure out where Mary J. Ford and Jerome Ford were buried. Now I had tried to find the East Cemetery in Bristol online and kept ending up in Plainsville and that East Cemetery did not work at all. Well the East Cemetery in Bristol is now the Forestville Cemetery. There were finding aids in the History Room that helped to pin this down. Cemetery listings which revealed their names and more. There was a card file of obituaries and I found them in that as well. They also had the newspapers for Bristol on microfilm. The city directories I asked were retrieved and I looked through them. I had Mary’s death but not Jerome. Well it turned out she had died several months before him but both within a short time of each other. Why he was not showing in probate I don’t know. The time slipped by and it was soon 4 pm and it appears that you can continue to work outside in the main library after the History Room closes. They will retrieve films and other things for you. Of course you will have to inquire. I was looking up the obituary and had to get my things out of the History Room. I like the librarian and I think his name was Terry? He was very nice, helpful and interested. The others in the room were also very helpful and gave me directions to the Forestville Cemetery. Apparently Jerome and Mary Ford lived in an area called Edgewood a part of Bristol to the north. It was a successful session and I had a street they lived on and the cemetery they were buried in. All I needed was death and other vital records. That would have to wait till tomorrow. 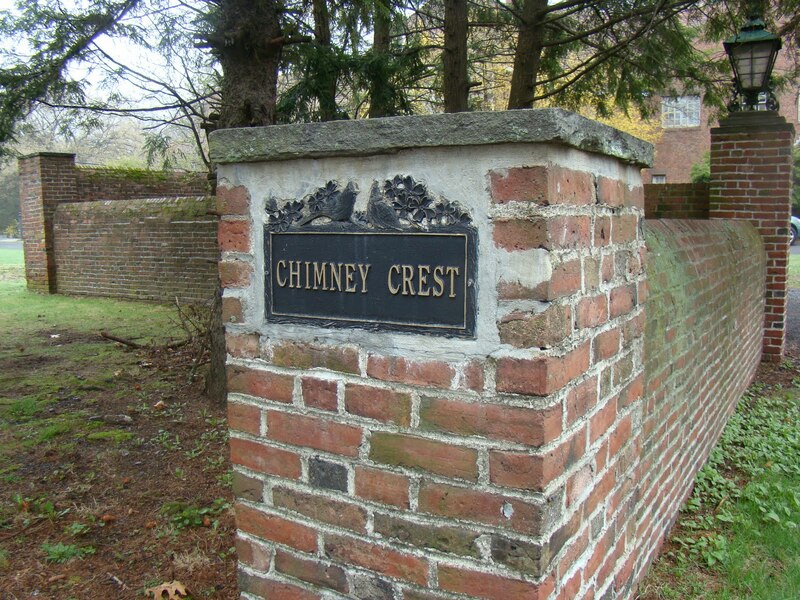 I choose the Chimney Crest Manor House to stay in in Bristol. From the library I took High Street east and turned on Goodwin St, then turned onto Sterns St. and drove through some brick pillars and found the home and pulled into the circular drive. 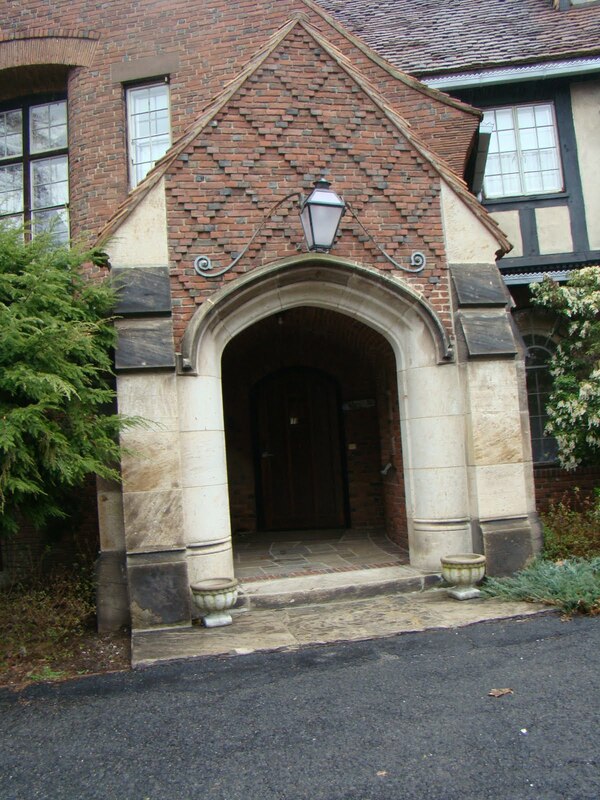 It is not too hard to miss because it is a very large Tudor style home. This manor house is like slipping back into the past. I felt like I needed to have a stylish dress on and not my black cords and velour jacket. I pushed the bell at the door and the hostess greeted me warmly. 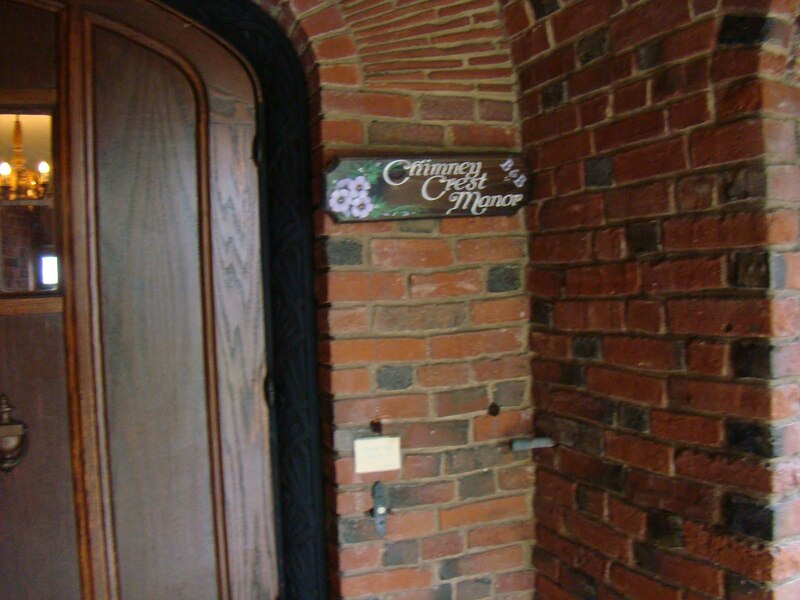 Notice the beautiful edging around the arched wood door. You enter this huge foyer and to the left is the formal dinning room and to the right is a rounded archway and the very large living area. My hostess was a delight. Friendly, warm and very attentive. We hit it off! 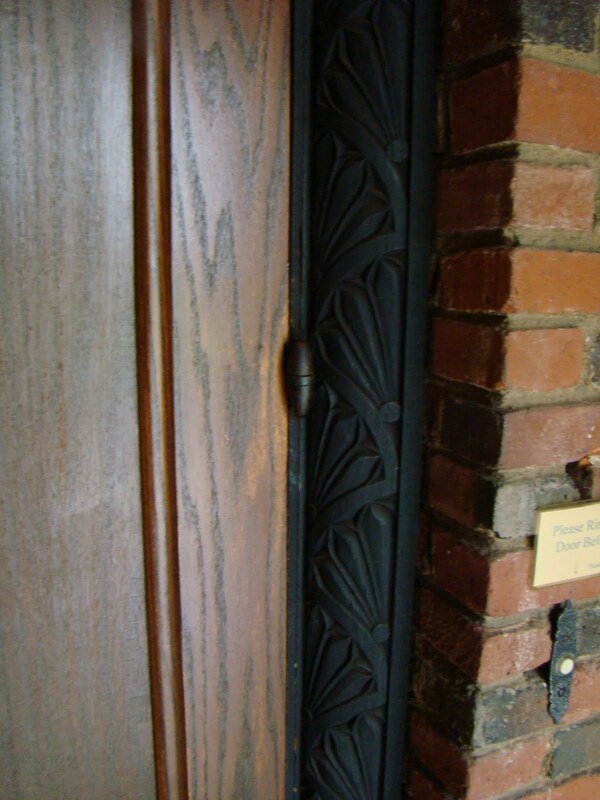 Business was quickly taken care of and a quick tour of the rooms on the first floor. WOW! 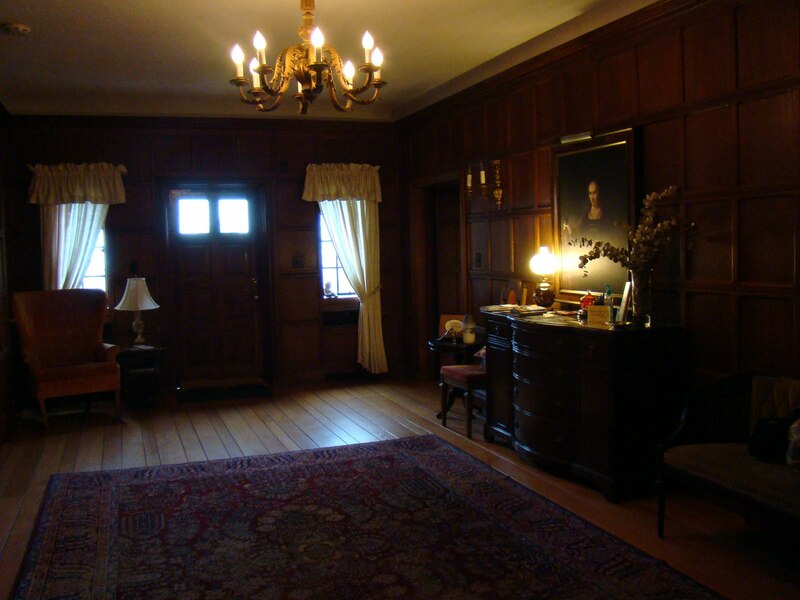 The living room was one of those rooms in which there are several sitting areas and a fireplace at both ends. Wifi was available but probably not in my room but in the other areas of the house. Up the stairs to the 2nd floor and there was a sitting area and down the hall to the right was my room. 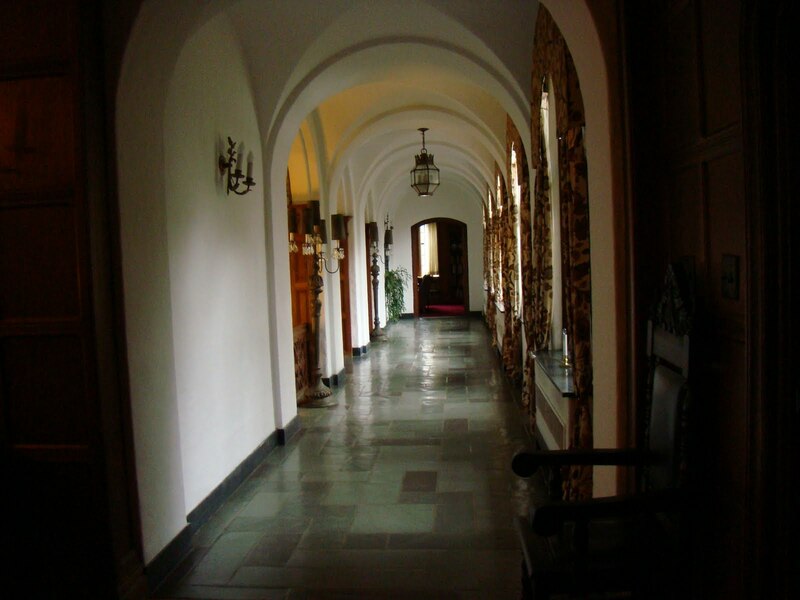 The beautiful hallway. The curtains are also rounded at the top. My room was a dream room large with a full bath. It it had a desk! A flat screen TV. My hostess asked is I drank coffee and I said yes and that I usually was up early. So she said she would bring me some items for that purpose? This home reminded me a little of Biltmore in Ashville, NC in some ways. My hostess tried to help me find dinner in Bristol but I was not prepared to a lot of driving. I was hungry and tired and tried find the pub we thought might be good and ended up at Carmine’s on Farmington Ave. I don’t know what it is about Bristol but my sense of direction was all messed up. I guess I am use to north/south not east/west or I was just very tired and starting to get over load?? Usually I find my way. My hostest even noticed I was messed up on east and west. HA! Carmine’s was pleasant and they had big picture windows so it was fun to see out and watch the city. My dinner was just fine. It was time for retiring, plenty of relaxing and getting ready for the next day.